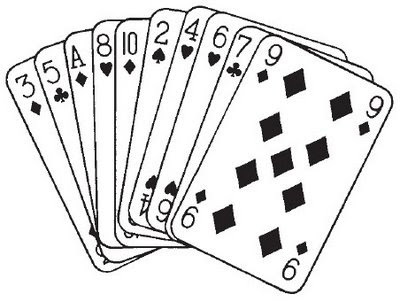 Effect: Ten cards are counted in a magical manner. Secret: The cards you use have been secretly arranged in the order shown. The actual suits do not matter. Run the cards, one at a time, from hand to hand. This reverses the order so the Nine is now on the top. Place the 10 cards on the pack. To show the trick count off 10 cards (this gets the arrangement back to normal, with the Three on top). Take the cards one at a time from the top of the packet and place them on the bottom as you spell A C E (one card to each letter). Turn over the card on the E and it is an Ace. Drop this card on the table. Now spell T W O – again moving one card from the top to the bottom of the packet for each letter. Turn over the "O" card, a Two, and drop it on the table. Continue spelling in this way until you get to 10. For the 10th card you have only one card left but pretend to spell the letters as before to amuse your audience.